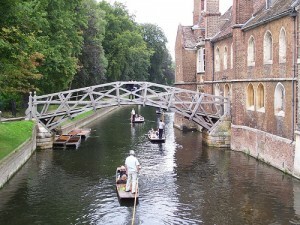 A weekend in Cambridge reveals columns and spires, manicured lawns and bizarre traditions. A short break here will give you a brush with history, architecture and an extraordinary number of cyclists. Cambridge celebrated its 800th birthday as a university town in 2009, so not surprisingly Cambridge has enough to keep history lovers occupied for weeks. This massive white complex illustrates the grandeur that the Tudor Kings were aiming for when Henry VI founded King’s in 1441. Both the scale and design impress, with carved white stone, huge stained glass windows and an overall palatial feel. King’s still broadcasts its Christmas Carol concert each year. 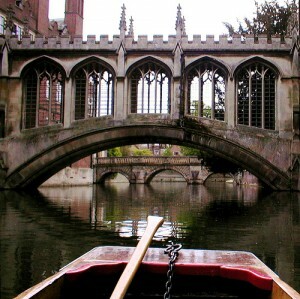 This bridge in St John’s College took its inspiration from the “Bridge of Sighs” in Venice, where legend says prisoners saw their city for the last time before walking into prison. The facts behind the story are hazy, but the arches and shadows within St John’s are beautiful. A flat path runs behind the main strip of colleges, lined with willows and oaks. The Backs give a calm, leafy and tranquil perspective, instead of the cycle and traffic jam mayhem that characterizes Cambridge’s city centre. Another legend is out in force here. This charming wooden bridge neatly connects two different courtyards in Queens’ College* and was originally built by Sir Isaac Newton. His mathematical genius ensured that all the components stayed together without requiring a single rivet or nail. When students dismantled it to try to work out how he did it, they couldn’t repeat his success. The historical facts don’t add up, but – hey – it’s a good story. Finishing off with one more vast and imposing college, Emmanuel (“Emma”) has two claims to fame: the chapel was designed by Sir Christopher Wren (architect of St Paul’s in London) and one Emmanuel graduate set sail to America in 1636 before leaving all his wealth to a college in Massachusetts. His name was John Harvard. By Rail: a fast train runs from King’s Cross in London to the station in Cambridge. The station is on the edge of town so you will need to take a bus or taxi from there. By Road: Cambridge is easy to drive to but parking is incredibly difficult in the city centre. You’d probably do better to use a Park and Ride service. Be warned that many of the colleges close during exams and certain other periods. Most have websites now so quickly check before you make any commitments. Entry to the Cambridge colleges is usually cheap or free, even at the weekends.